The UK Manchester WKO took place on Sunday at Fanboy 3 and I went along to compete myself. We had 17 players in total, which then subsequently dropped to 16 when a player pulled out midway, so, with peoples travel arrangements & the drop out in mind we ran to 4 rounds of Swiss followed by a top cut run down of 8/4/2. Norman Osbourne – Dont Call Me “Gobby”! It’s a Villain team, and the plan was to line up ‘The Spot’ and ‘Superhero Registration Act’ for some big ramp and get my oppressive line up of ‘Thanos’, ‘Blob’, and ‘Madame Masque’ (Along with ‘Bishop’, who admittedly doesn’t fit the theme) out, hopefully locking my opponent down while ‘Nobby’ and ‘Thanos’ deal the damage. ‘Captain Cold’s Cold Gun’ and ‘Blackbird’ have been added for some extra utility – ‘Cold Gun’ is there for some Spot removal/game-text blanking as I need it and, with my own a Global usage quite light, ‘Blackbird’ for it’s global. First round I was up against Seth, a Manchester regular who I’d played many times before. I’d probably say that, in the grand scheme of times Seth & I have played each other, both competitively & casually, Seth had won more than I had. Plus; as we had been WKO testing teams as part of the same play group for a little while I’d knew a bit about the team I was facing, so knew I was in for a tough time right out the gate of the event. Seth was playing a Villain themed team too, and I could see that his Win Condition was a ‘Nobby’, ‘Danger Room’, ‘Adam Warlock’ combination. It looked pretty brutal to me. I was also immediately conscious of Seth’s rare ‘The Collector’ rare ‘Cold Gun’ and ‘Shriek’ hanging out on his team. I stuck to the plan and went for my ramp first, making ‘Spot’ and a ‘Superhero Registration Act’ my first two purchases. Seth could see immediately what the script was there and set about buying my ‘Superhero Registration Acts’ out from under me. It was OK though, my ramp kicked in and I went shopping, getting ‘Madame Masque’ & ‘Blob’ to do their thing. (I’m trying to remember for the life of me what I targeted with ‘Blob’, but it just isn’t coming to me, I’ve got a feeling it might have been ‘Cold Gun’ or Seth’s own ‘Nobby’) I also grabbed some ‘Nobby’ dice and a ‘Thanos’ too. Things fell into place, and I had everything running as planned. ‘Thanos’ came through for me well, aided in no small part to Seth whiffing on rolling his ‘Shriek’ purchase a number of times and giving me time to get ‘Thanos’ out and onto ‘Shriek’. With the total combined number of both our ‘Villain’ affiliations and a bit of bonus from ‘Thanos’ I was able to get a few killer ‘Nobby’ shots off (I also made cheeky use of Seth’s ‘Danger Room’ global to recycle my ‘Nobby’) and I was able to deliver lethal. The second game of the round went much the same way. I replicated my purchases as closely as I could from the first game and used my control to lock down Seth as much as possible. My memory is a bit hazy on the specifics (first round of the day n’all that) but I’ve got a feeling I didn’t get a ‘Thanos’ out in the second game and I used ‘Blob’ on Seth’s ‘Cold Gun’, but I can’t pin it down in my head. What I do know is that I bought ‘Nobby’ die and whittled Seth down with his direct damage game-text. Next up I was playing the 2016 UK Champ Ben Said Scott, yet another player against whom my win/loss ratio was not favourable. Ben was playing an ‘Infiltrate’ team that centred around ‘Ricochet’ and ‘Angela’, with ‘Firestorm’ for spot removal and ‘Cosmic Cube’ for added pain. Ben was quick to get a couple of ‘Ricochet’ die bought and I built my ramp machine and grabbed my ‘Bishop’ to mitigate the direct damage I knew I’d be facing. ‘Ricochet’ hit the field quick and Ben immediately started pinging away and using his game-text to ramp up to a ‘Firestorm – Host of the Matrix’ die and an ‘Angela – Hunter of Demons’ die. ‘Firestorm’ was an inspired choice. I had nothing to protect me from such a ‘when attacks’ ability, and with a few Sidekicks on top of his core characters it wasn’t tough for Ben to KO my ‘Bishop’ to Drive his ‘Infiltrate’ damage through. To top it off, Ben had taken to using his ‘Unstable Cannister’ global to ping off my ‘Spot’ whenever I forgot/couldn’t afford my ‘Blackbird’ global to lower my ramp potential. I grabbed up some ‘Nobby’ die and a ‘Blob’ die to try and a. Slow Ben down and b. Get a bit of damage of my own going, but I’ll be damned if I couldn’t roll ‘Nobby’ on anything but energy and ‘Blob’ on his lowest level (making him ‘Firestorm’ fodder). When Ben got around to buying a ‘Cosmic Cube’ it was all over. The second game went a *little* better, but only in the sense that I drew a bit of blood of my own too, I still lost. ‘Firestorm’ proved to be the same pest he had been in the first game at keeping my defensive measures at bay, but I sneak a few cheeky ‘Nobby’ hits in of my own before I became overwhelmed with ‘Cosmic Cube’ enhanced ‘Infiltrate’ damage. In my third round I was drawn against Steve, a fellow Manchester player and regular online dude in the community. 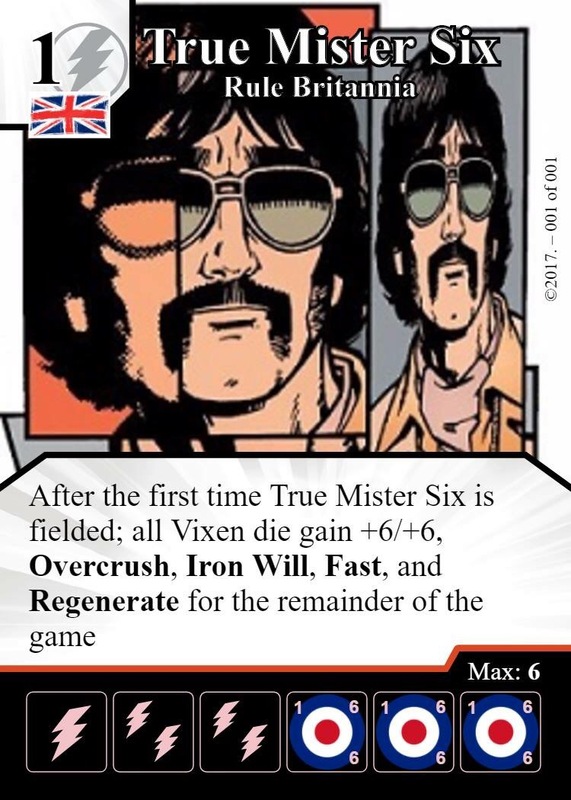 Steve had about the worst spread of cards I could hope to see on the other side of the table – most notably his ‘Casey Jones – Mutant Hunter’ and ‘Thanos – I am Become Death’, two really grim pieces of Villain tech that would really mess up my team. Steve also had a couple of ways to drive his damage through: big bodies & ‘Cone of Cold’ + ‘Casey Jones’ for board clear, and an Overcrushing ‘Supergirl’ with ‘Cone of Cold’ Globals to get her pumped up. I was sweating. The first game was a slog. Steve got his ‘Jimmy Olsen – Signal Watch’ Out and followed up with a nice cheap ‘Superman – Hero of Metropolis’. This was manageable I thought – I’d ramped up to a speedy ‘Thanos’ purchase & field (targeting ‘Jimmy’) and grabbed a ‘Cold Gun’ with a plan to shoot his ‘Jimmy’ to get him cycling around for some ‘Thanos’ damage. That was until he swiftly followed it with a cheeky rare ‘Knowhere’ switcheroo and pulled ‘Thanos’ into his field – blanking all my lovely Villains. I bought some ‘Nobby’ die and cycled round ‘Cold Gun’ to blank his ‘Thanos’ (which it did, thankfully rolling on Burst each time) and managed to get quite a bit of damage through between ‘Nobby’ and a lucky bit of combat damage from an attack. But it was to no avail – Steve got a ‘Casey Jones’ out and swept away all my Villainous blockers to smash through for lethal. The second game was a different story. I used my ‘Blackbird’ global to blank his ‘Rip Hunter’s Chalkboard’ Global to slow down ‘Jimmy’ hitting the field, but not before I using it myself to get my own ramp machine going fast. I bought a few ‘Nobby’ die and got set to deliver some direct damage with him. I also got ‘Casey Jones’ froze out with my ‘Blob’ and got a stroke of luck when Steve whiffed on his ‘Jimmy’ roll. I chipped away, but it wasn’t easy. Steve had pivoted to his Overcrush ‘Supergirl’ and sent a few of her die down the field at me to put me in a position to make some tough choices, the main impact of which was choking my spends as I saved an increasing amount of Mask energy each turn to use my ‘Blink – Transmutate’ global. It all came together in the end though, with one good ‘Nobby’ hit and a nice excess of attackers to his blockers I delivered lethal just in time to finish on a tie. My final round was against Paul, who we joked I had played against in pretty much every WKO I had ever gone to. It just wouldn’t be a WKO if I didn’t end up facing off against Paul. His team was built around the SR ‘King Black Bolt’ with the plan to target him with the ‘Agent Venom’ defense pump Global to deal damage. There was also a ‘Storm – Extra Lightning’ in there for a back up plan B win condition. We both came out of the gate swinging hard. I went straight into my ‘Spot’ & ‘Super Hero Registration’ ramp towards my ‘Thanos’ and Paul picked up his ‘Knowhere’ and ‘Katana’ to go for the ‘King Black Bolt’ switcheroo, which he did super-fast. Seeing Paul’s strategy moving a little quicker than mine I altered course slightly and grabbed up a ‘Bishop’ and held ‘King Black Bolt’ at bay with some ‘Blackbird’ global in the meantime. Everything fell into place – ‘Bishop’ came around nice & quick thanks to SRA and managed to lock down Paul’s direct damage and I turned my attention to grabbing some Nobby dice. Paul pivoted at that point, leaving his Black Bolt strategy and buying up a ‘Storm’ along with some ‘Reclaim’ BACs & Cold Guns. I saw that Paul’s Cold Guns were going to be an issue so grabbed a ‘Blob’. I also started buying ‘Cold Guns’ of my own. Then, a big ramp turn came in the nick of time and I was able to buy up ‘Thanos’, who luckily came through my bag quickly enough to target Paul’s ‘Storm’ before she was fielded. In the meantime Paul got a ‘Blob’ in the field and targeted my ‘Nobby’. It was then all about timing the ‘Cold Guns’ & ‘Nobby’ to drive some damage through while waiting for Paul’s ‘Storm’ to cycle for some added damage. This worked, but all this back & forth had taken a long time. We went to time and rounds. Then, it went pear shaped. We were in the fifth & final round after time had been called and Paul was on 7 life while I was on 20. I had two Nobby’s, two SRA’s, a Spot, and some Sidekicks in my bag. One good Nobby and I had all I needed to hit for 7 and win. I drew – a Nobby, a SRA, and two Sidekicks. I rolled. All energy. I re-rolled. All energy. I stared at the board. I did all the maths I could. An all out attack would take Paul down to two life. I didn’t have it. I tilted so bad. I was… like… sea water salty. I couldn’t believe it. I asked “what happens now?”, knowing an incomplete game was most likely a tie but hoping desperately a Rules update had happened to favour highest life, or give me an extra round or something. But no, a tie it was to be. My saltiness went from Mediterranean to Dead Sea. I’d concentrated so hard and played so carefully to try and eke out another win in the last round of Swiss and hadn’t managed to deliver the killer blow. So, there it was, I ended on 1W – 1L – 2D and ended Swiss in the 9th spot and narrowly missed out on the Top 8 cut. I hung around to see how things panned out for the remainder of the event, did a little trading, and did some post-game analysis chatter with some of the guys. I’ll need to make a decision whether I play one of my other teams for next weekend’s WKO or stick with this one – so come back next week to see how that pans out. Thanks to everyone for the games and making it, yet again, such a fun and enjoyable event. I’d also like to say a quick “hello” to Oliver and Pete – two new faces I met for the first time on Sunday and hope to meet again at an event soon. Hi guys – it was a pleasure to meet you. Enjoyable read/enjoyable day. Really proud that Seth bounced back from that defeat to win his next three matches, and only missed out on a semifinal spot by one point of damage in 5 turn sudden death. Played son. As for our game Chris and my penny’s worth….in one word: “usual” or maybe “grind”. In two words: “usual grind”. Rematch at Chimera? Please no. Think of the children!! !